At Re-feel we also manufacture and supply high quality remanufactured cartridges. High quality spares are used to produces cartridges that performs at par with original cartridges without compromising on output. Remanufactured cartridges offers huge savings of up to 50% as compared to OEM printer cartridges. These cartridges are ready to ship on order. We offer a wide range of remanufactured and reconditioned cartridges which are reliable and provide quality printouts that meet or exceed OEM standards. These cartridges are manufactured to the highest standards possible using only new Static Control components. 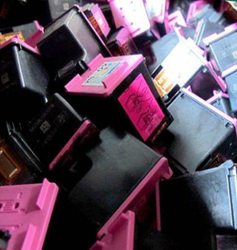 Inkjet Cartridge remanufacturing is being done using virgin (one time used) inkjet cartridges. We use latest inkjet cartridge remanufacturing machineries & cutting edge inkjet cartridge remanufacturing technology. Inkjet cartridge remanufacturing is being done using high quality ink which is almost equivalent to original. Summit Print Rite Pvt. Ltd.
High Quality Nanojet Inks, Print as good as OEM. Economically Versatile. Save Environment by reducing E-waste. If we do not have your cartridge in stock, we can remanufacture your toner cartridge. Some toner cartridges are so new, that we do not have a good supply of empty cartridges to refill. Simply save your empty cartridge and call Toner Refilling line (TRL) when you are ready for a replacement. We bring forth our vast industrial experience and expertise in this business and are instrumental in offering wide assortment of Refillable Cartridge.